Hubert is a small but growing community in the eastern part of Onslow County that offers its residents the natural beauty of North Carolina along with convenient business, shopping and tourism opportunities. 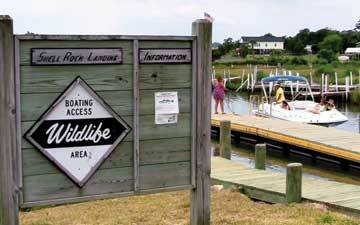 Adjacent to the Intracoastal Waterway and is the home for the largest local North Carolina public boat ramp. Boaters love the ramp's easy access directly into the ICW. Water activities and seafood are a way of life for Hubert residents. There are plenty of ways to enjoy the outdoors including boating, fishing, bird-watching, hiking, and kayaking. Beaches are close by including Emerald Isle, Hammocks Beach State Park, and Onslow Beach aboard Camp Lejeune. Hubert borders one of the largest United States Marine Corps bases in the United States, Camp Lejeune, and thus has an extensive and constantly increasing military population, lured to the area for its convenience to Camp Lejeune's NC Hwy. 172 entrance. Hubert is located a few miles from Swansboro, NC, where a variety of restaurants, shops and other businesses can be found. Jacksonville and Morehead City are both just a short car ride away. Sand Ridge Elementary School, an award-winning member of the Onslow County School System, is located in Hubert. Additional schools are located in Swansboro and aboard Camp Lejeune.